The easiest way to meet your daily nutrition goals. Track your eating, hit your goals, and focus on your success, all in one easy-to-use app. 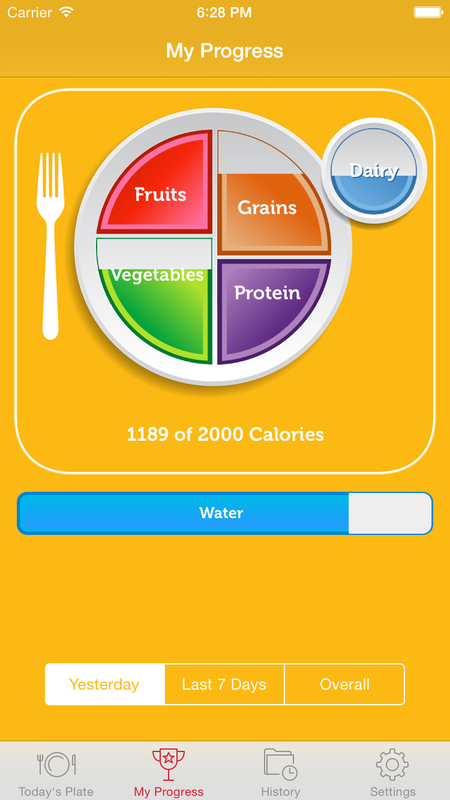 Inspired by the USDA's MyPlate icon, My Daily Plate makes eating right easy and fun. Leave the calorie counting to us. Trainers love My Daily Plate for the export feature that emails your progress right to them, and users love the positive focus on what you should eat, rather than what you shouldn’t. Both love the simple Today’s Plate home screen, which shows your daily goals and progress in one colorful glance. With this easy, user-friendly app, there is no typing, no keyboard, no data entry required. With a few simple taps, you enter your food and track your success. We help you focus on the bigger picture of nutrition- eating the right portions of the right foods –so that calorie maintenance naturally occurs. There are no categories for foods that fall outside of these groups (i.e. junk food), because those foods do not contribute to your daily requirements and overall nutrition goals, which is what we’re focused on. It’s not only about what’s healthy, but how much. All too often, people looking to eat right, eat wrong, erring on the side of too much protein, too few fruits, or out of proportion portions. With this app, you can clearly and simply see whether or not you are eating enough fruits, vegetables, protein, grains and dairy, and can adjust your next meal accordingly. The rewards are both instant and long-term! Start thinking about what’s significantly contributing to your nutritional needs rather than trying to track all the bad food you eat. Rather than feeling guilty about your bad choices each day, feel proud of and track your good choices using My Daily Plate app. - Filling your plate at each meal is quick and easy. Just tap the food group, item, and quantity. - The plate clears itself at midnight so you can start fresh the next morning. - A healthy way to monitor everything you eat in the course of a day. - Enter the water you drink in your preferred unit of measurement, but see equivalent amounts in other units. - Track your progress visually instead of deciphering lots of figures. - Check and see how you did the previous day. - Get an average of progress of the last 7 days. 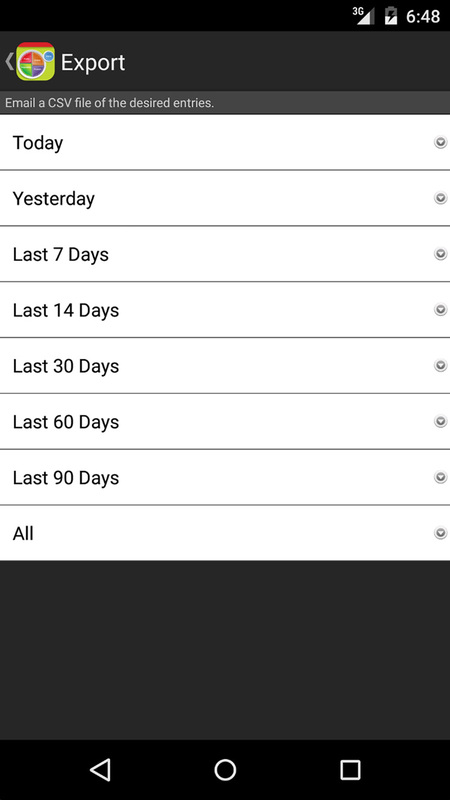 - Get an overall average of the recorded days since the date of your first entry. 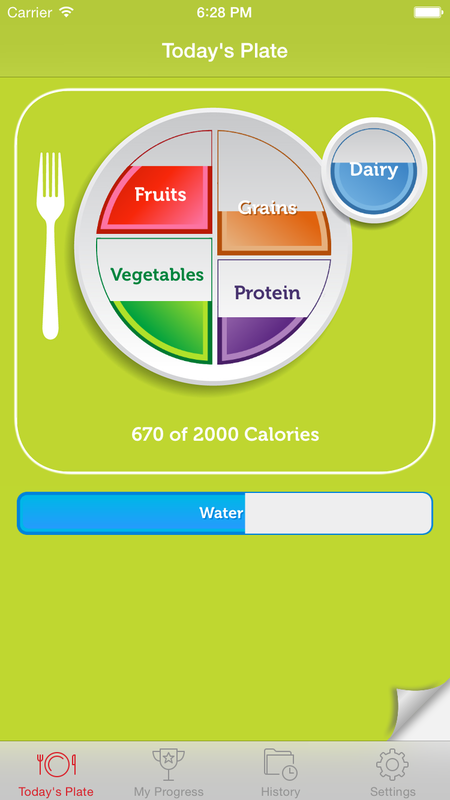 - View your daily average calories. - Export your data to a CSV file (comma delimited) and send to your personal trainer or dietician. 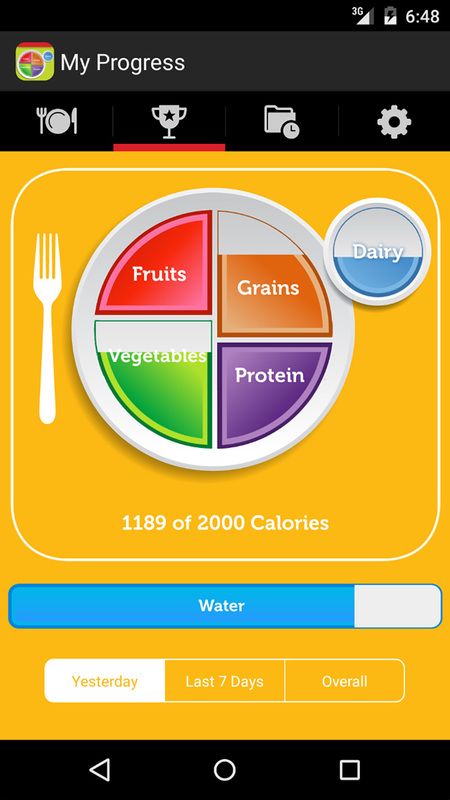 - Review your eating habits on a specific day. - Edit any existing entry. - Add a previous entry you forgot to make. 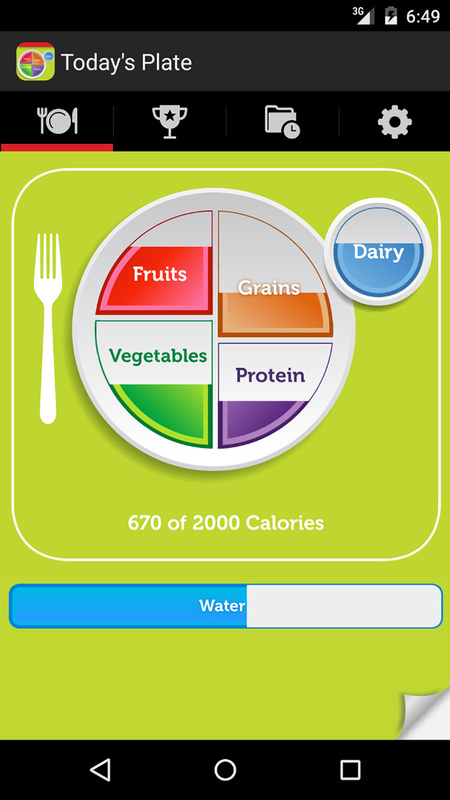 - View the daily calorie goal recommended by the USDA based on your profile information. - Set your daily calorie goal based on your preference or personal trainer/dietician’s guidance. 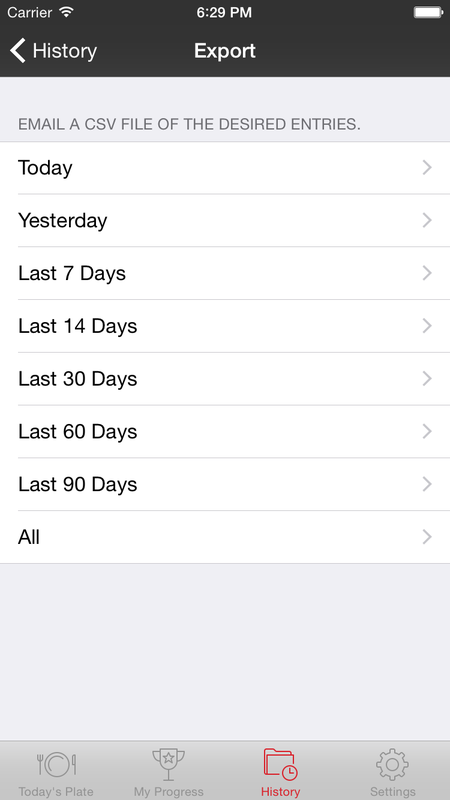 - Enable/disable the alert message when you reach a specific daily goal. - Delete all the entries in your database to wipe the slate clean and start again. - Completely revised nutritional database of food choices. 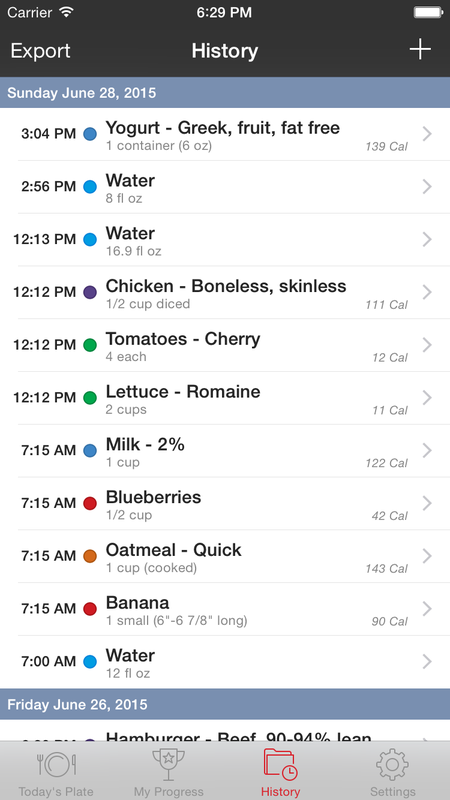 - Estimated calorie counts are displayed. - Support for various screen sizes (iPhone 4, 5, 6, 6 Plus, and all Android phones). 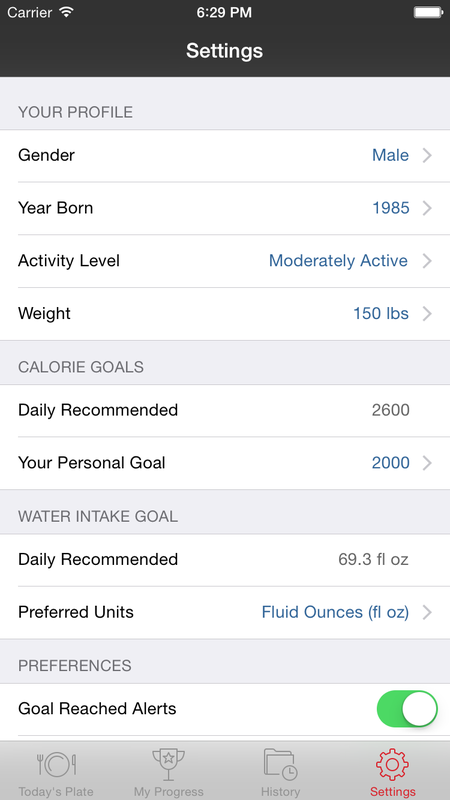 - USDA recommended calorie goal calculated based on your profile information. 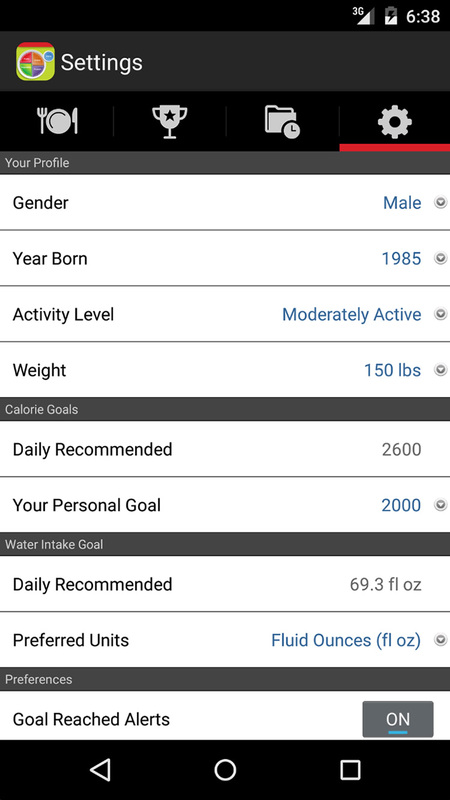 - Water intake tracking and custom goal calculation. - Food group goals are based on your personal calorie goal setting and information. 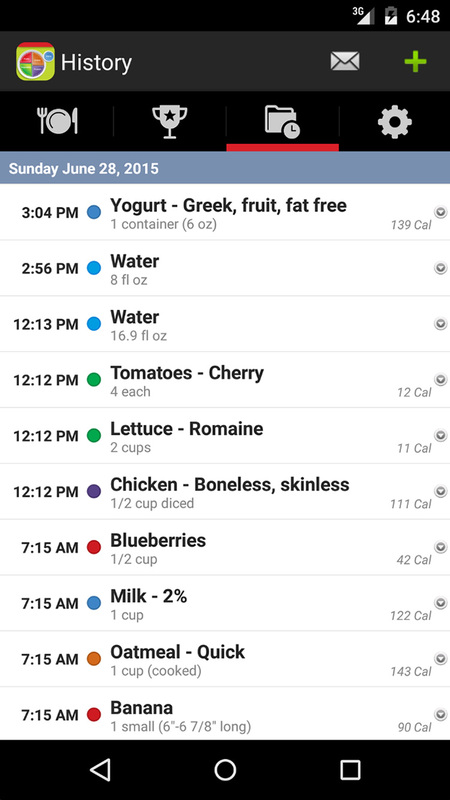 My Daily Plate checks for the latest nutritional data from CookingDistrict.com once each day and updates automatically. You can tap on the "Nutrition Info" row in the Settings tab to verify that you have the latest.